As Store search is most popular discovery avenue of mobile apps and game (Nielsen 2015), it is important to know what part user reviews play in Google Play and Apple App Store search ranking algorithms. Inside Mobile Apps conducted a study in which they examined a random sampling of easy, medium and competitive search terms on both Google Play and App Store to see how each app ranked based on the average user rating in the search list. 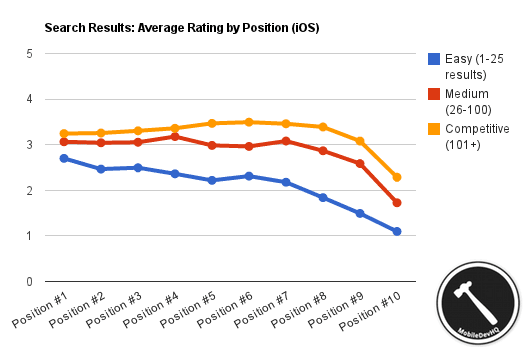 Based on the findings of the study, it is clear that average ratings play important part in both stores search ranking algorithms. Thus, review optimization is crucial for increasing the search rank in the app stores. 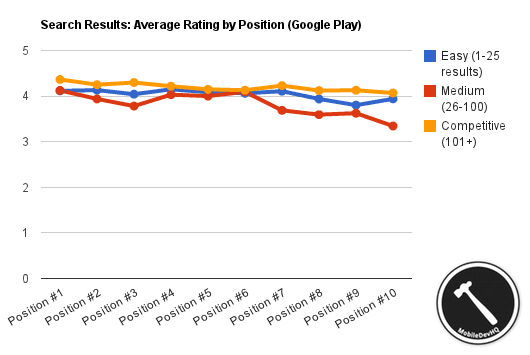 Google Play places more importance to avg user rating in search ranking. Review optimization is a set of processes and tasks with a goal to maximize the amount of positive user reviews and ratings for the game on the Store. So let’s take a deeper look of all of the different factors, one by one. User’s emotional state at the time of asking for a review is related to feelings which the user might feel during the time when asking for a review. As games are emotionally very intense products (at least for avid gamers), it is of paramount of importance to be able to identify potential feelings of user at this time. Typical way of doing this is to use behavioral analytics. For example, usually users are feeling satisfied and positive after winning battles, leveling up or after receiving some sort of rewards in the game. So a good time for asking a review could be after user comes back to the main view after victorious battle, or after the player has leveled up his character. Suitability of the time when asking user for a review means that is it best possible frame of time to ask for a review from the user. Even after successful battle, it might not be the best time to ask for a review since user might have got rewards or in-game items from the battle which he is planning to use to upgrade his troops in the card battler game. So asking for a review at this time just distracts and annoys the user from accomplishing his main goal at this time. So how do we know what is the best time to ask for a review? Once again, we have to turn to analytics for help. Specifically, we are analyzing in-game events which have happened shortly after the user has left the game and stopped the session. Typical good points of time might include the time right after the energy has run out in free-to-play game or after user has started training of troops in town battler game AND when he doesn’t have full amount of troops ready. Also, it is a good idea not to ask for a review in the first sessions of the game due to user still being novice to the game so don't know much about the game. Different genre of games have different mechanics and different games have completely different optimal points of time, so best thing to do is to analyze the data and tie the user review feature to these in-game events. Motivation for user to give a review related to Call-to-Action texts and rewards that motivate user to give a review. Usually, it is a good rule to explain shortly why it is a good thing to give a review of the game. These CTAs might be e.g. “Please give a review, it helps us to make the gaming experience better for all of us!” It is also a good idea to reward the user for giving a review with some unique reward. This is necessary to optimize the review funnel despite the fact that there is no way of getting the information from App Store that has the user actually gave a review. Great visualization of review optimization process for Circa News app. The ability to hide negative reviews refers to the rules within the game how the reviews are handled. One common strategy is that if users give negative review (below 4) of the game, review mechanism asks, in-game, what could be done to make the game better. After the user has typed in the feedback, then the review component can ask user to submit that to developers via in-game support-button. Note that in negative review cases, the user is not asked to leave a reply to App Store or Google Play page. 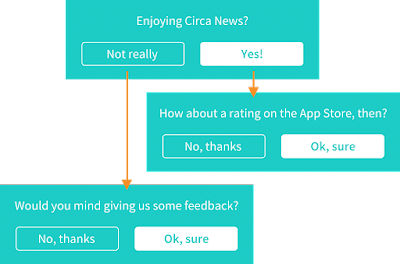 In positive review cases (4-5), the user is asked to leave a review to App Store or Google Play product page after the in-game review prompt.